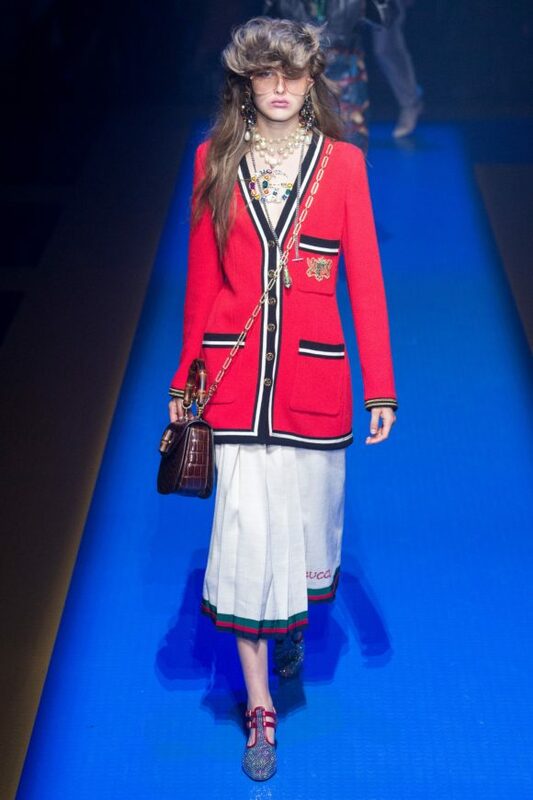 As a rational being don’t you wonder what’s going on in your head and in the fashion world at large after looking at another Gucci show? I’m repulsed, amused and attracted to what I see all at once, without fully understanding what new form of manipulation I’m experiencing and why I’m not on to it yet. My rational self is saying this is thrifting on steroids with fearless styling, but who would wear that anyway outside of a Gucci after party? 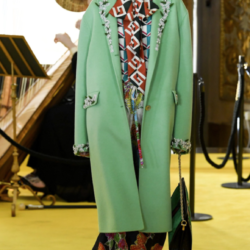 Simultaneously I’m loving the bag, the shoes and the jacket and can’t wait to see them in real life at Dover Street Market where I’m encouraged to play dress up. 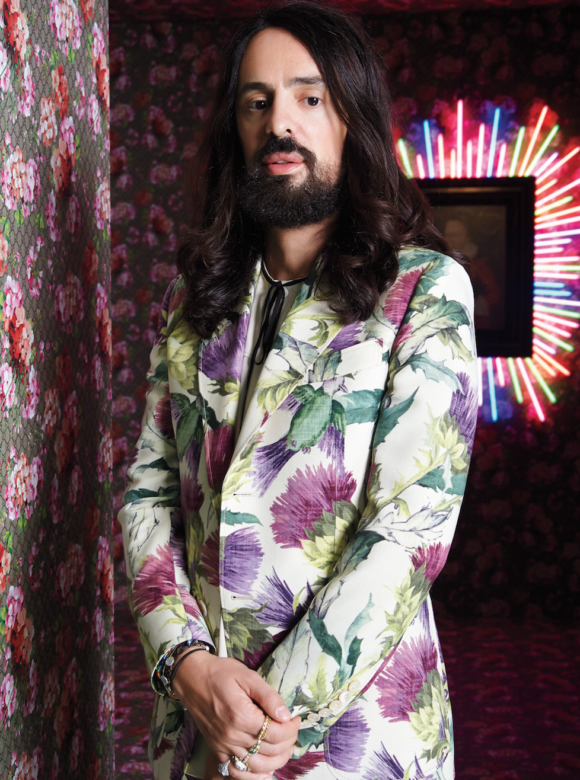 After looking at the latest spring show I experienced all of the above but this time I finally get it, the genius of Alessandro Michele. 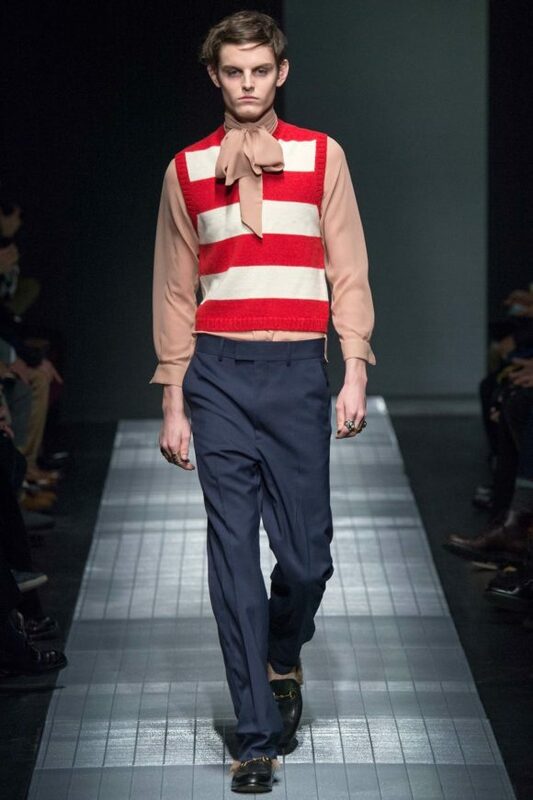 Michele’s first Gucci show was for men in January 2015. 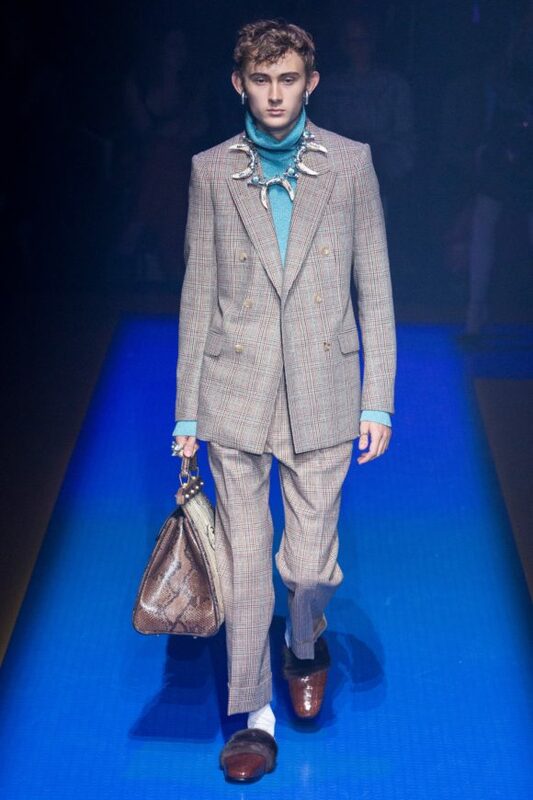 As legend has it, after the acrimonious departure of Frida Giannini he had five days to pull the menswear collection together. In retrospect that seems impossible, so fleshed out were the building blocks for what was to come. The androgyny, which was already in the air, was the theme and has since become a defining aspect of popular culture. Not to say Michele made it happen, rather he harnessed the right movement at the right time. The berets, the louche attitude and, the accessory that pays dividends, the fur lined horse bit slide were all there. That does not happen in five days. I imagine behind the scenes corporate intrigue and a heads up to Michele happened earlier. Whatever the case, with all the designer musical chairs of late, none have burst on to the scene as fully formed as Michele. 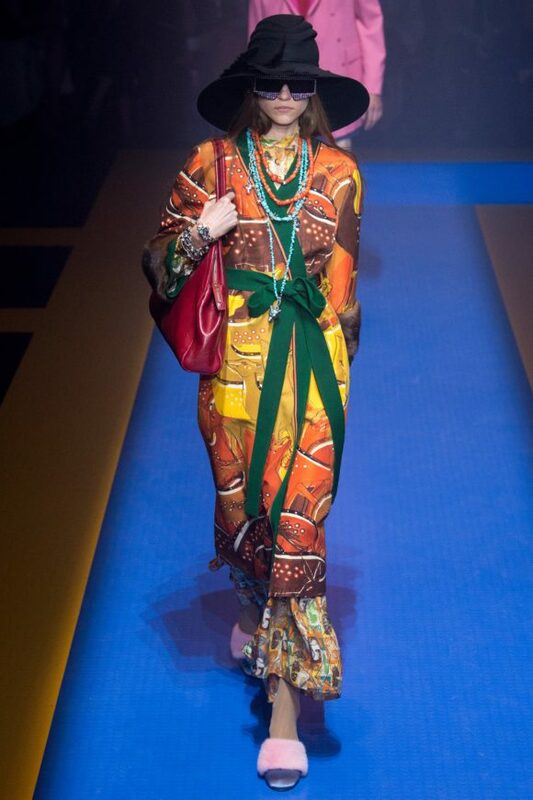 In less than three years and eleven seasons Michele has made Gucci into the envy of the luxury market. Sales are on fire, driven by the accessories, like the aforementioned slide, which I cannot walk a block in Manhattan without seeing on someone. 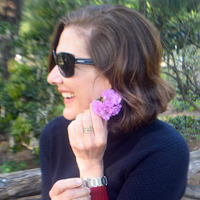 Michele has doggedly built on top of the foundation laid in January ’15. With each season he adds and expounds on his nostalgia tinged, more is more aesthetic. He has single handedly changed the direction of fashion by oddly taking fashion backwards rather than forward. The genius of Michele is not his aptitude for design but his intuition and imagination. He intuitively knows that the show must transport the audience down a rabbit hole of his own making. Michele’s world is a derivative soup of different cultures, time periods and antiquities seen through the prism of the 70’s and 80’s, perhaps because he was born in Rome in 1972. In lesser hands it could be a mess. He’s a master showman and develops the show concept and collection simultaneously, considering the space, light and music. He knows the importance of buzz and he has cultivated it fearlessly and with conviction, taking even the most jaded editor willingly along for the ride. I love everything about this look for me. 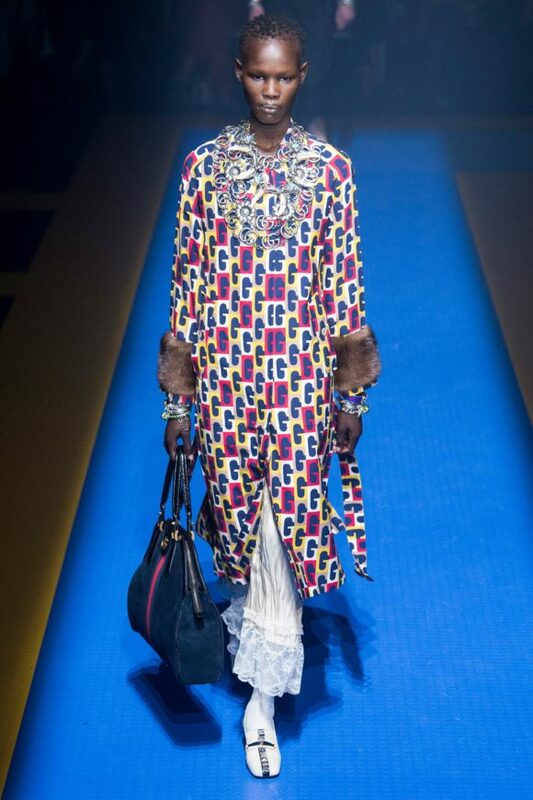 In real life I have yet to see someone in full out Gucci regalia which leads me to the second part of Michele’s mastery of the art of branding. From the beginning he has repurposed the old Gucci staples. The horse bit, the green and red stripes, the logo, and bamboo. 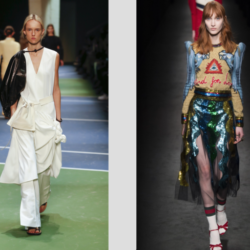 He tucked them into accessories and clothes and folded the solid commercial pieces seamlessly into his show vision making it easy for the consumer to buy into the fantasy without looking like a victim. Take apart his most outlandish looks and you’ll have a small boutique worth of commercial accessories and separates guaranteed to sell. And there in lies the magic. 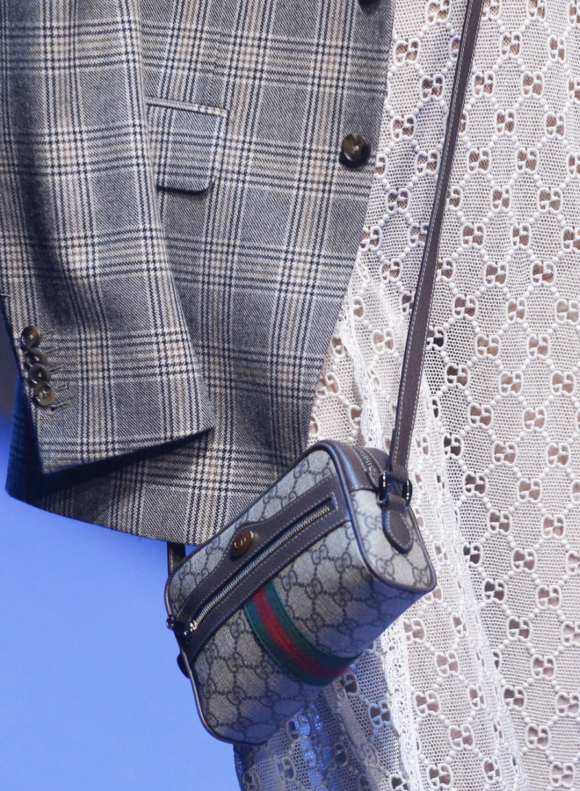 This bag showed up on the runway over a dozen times and notice the eyelet logos.